www.arizonaea.org | Vol. 43 No. 3 THE OFFICIAL PUBLICATION OF THE ARIZONA EDUCATION ASSOCIATION EDUCATOR BAZAAR Supporting New Educators PAGE 8 IN DEPTH LOOK Charter Schools PAGE 29 GOVERNANCE AEA Board and NEA-RA nomination forms and election information. 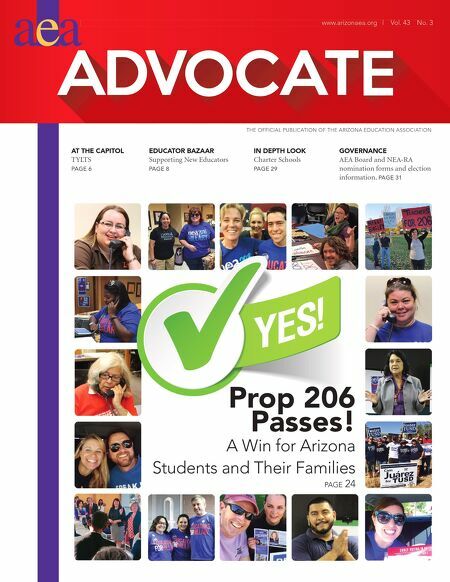 PAGE 31 AT THE CAPITOL TYLTS PAGE 6 A Win for Arizona Students and Their Families PAGE 24 Prop 206 Passes! We are AEA members recognized for the outstanding workthey do with our students. AEA Members Get Out the Vote for Schools!